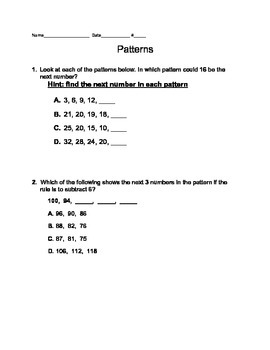 This is a 4th grade, common core patterns test. It does not include a constructed response, that is why it is priced lower than my other assessments. It is an 8 question assessment that takes up 6 pages. This test includes hints on various questions for those students who need cues. You can always white them out before copying the assessment. This could also be used as a practice assignment.